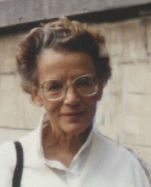 Margaret Johnstone, physiotherapist and Founder of the Johnstone Approach died on the 13th of April 2006 in Peeblesshire, Scotland. Mrs. Johnstone graduated from the Royal Infirmary in Edinburgh in 1943. The inspiring farewell message: "now you are ready to begin learning", remained a lasting motto. Learning as a life long process, reflected in her work of searching for ways and means to get even the severely impaired stroke patient actively involved in their rehabilitation process. Her first job was in a war-time neurological rehabilitation unit near Edinburgh under the inspiring direction of Prof. Norman Dott. This was followed by two years general experience and 17 years in orthopaedics with children and polio patients. The valuable knowledge she had accumulated then influenced her future training ideas when faced with acute stroke patients in her next career move. In 1966 Margaret started using inflatable air splints. It was the result of her search for a simple and practical way to address the consequences of poor rehabilitation of the arm and hand, and limited resources for professional follow up. The use of splints and other tools in therapy sessions empowered patients: they facilitated autonomous practice and additional (group therapy) sessions; Margaret paid specific attention to keep the hemiplegic limb out of compensatory patterns and the detrimental movements of the low motor stroke patient to a minimum. This could be regarded as an early idea of "forced use" and as definitely pioneering work. With her sister Ann Thorp MCSP, she developed several inflatable air splints for adults and children. Her life's work in particular for the stroke patient with severely impaired motor control, is being further developed and updated with theories of contemporary motor control and motor learning. The Johnstone Teaching centre is based in Switzerland and supported by instructors from various countries. Research projects are set up and published; e.g. a single-blind, randomised, controlled multicentre trial and a 5year -follow-up of the same study. (Feys, H. in Stroke, 1998, 2005). Those of us who had the privilege of working with and learning from Margaret Johnstone recognised not only her qualities of hope and passion for the profession, bursting with ideas for future initiatives, but also her great common sense, energetic personality, wonderful sense of humour and awesome determination. Margaret Johnstone is survived by 2 sisters, Mary and Ann, and her son David, all living in Scotland.